spinnaker downwind and on reaches. If you’re an advanced beginner, this sailing level 2 course is ideal for you. High performance sailboat racing classes also expand and solidify your knowledge and confidence levels related to safety aboard. Repeated exercises in our performance racing school help you master techniques without even thinking about them. Even if your ultimate goal is cruising, you’ll find this your experience in our performance sailing school invaluable in re-establishing your understanding of safe and efficient sailing. 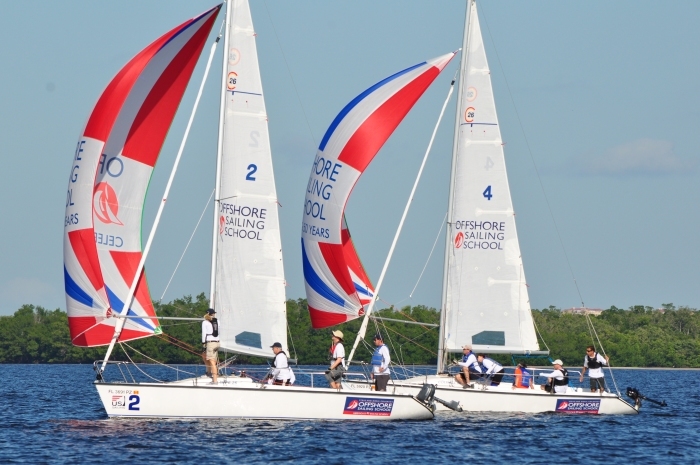 The Performance Sailing Course (OSS 102) is taught in a powerful action-packed five-day schedule throughout the year. 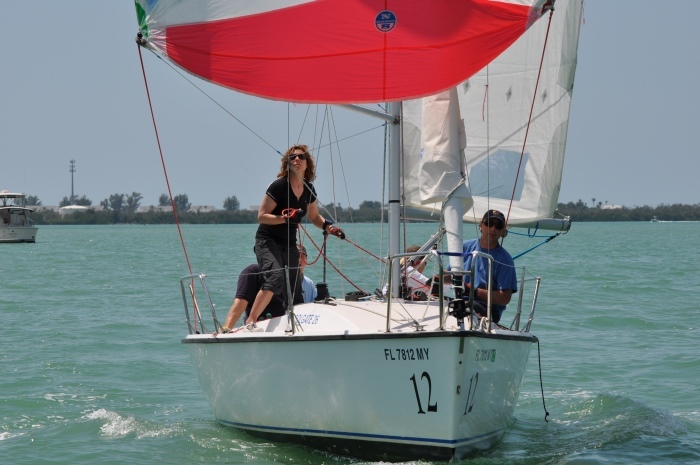 Once a year prior to our popular Performance Race Week (OSS 109) a 3-day accelerated sailboat racing class is conducted (see “What’s Included” tab for package rates for this special course). 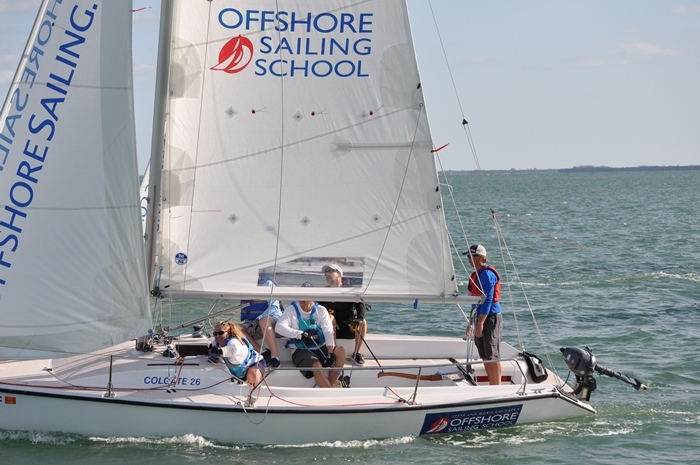 Combine that 3-day course with our 7-day Performance Race Week in Fast Track to Performance Racing (OSS 102/109) – the most exhilarating in-depth sailboat race-training program there is. Ask for a quote on our sailing level 2 course below! If you have family or friends who might be interested in a Learn to Sail Course or a Cruising Course these Offshore Sailing School courses are available on the same schedule as your sailboat racing class, with free time to enjoy other resort activities each day. You sail with no more than three other classmates and your instructor aboard, insuring close individual instruction and no down time. Proof of all you learn is the test sail without your instructor aboard at our performance sailing school. Certification: Colgate Performance Sailing, US Sailing certification coming soon. Package rates include accommodations and vary by season and location. Not included are meals, travel and other expenses you may incur. Please call 888-454-7015 for rates. Offshore Sailing School knows we cannot thrive without great employees and products. All graduates are asked to fill out an evaluation at the end of the course. The following testimonials come from those evaluations and individual correspondence with recent graduates of the Performance Sailing Course. Many are happy to correspond by email or phone with you. If you would like us to put you in touch with anyone below, please call 888-454-7015 or email sail@OffshoreSailing.com. Three of us have chartered internationally for four years, so when it became clear that our skills needed to be improved we reached out to the Colgates. I took a big boat refresher to qualify for the US Sailing International Charter Certificate, and then a Performance Sailing class. My crew took Fast Track and our wives all took Learn to Sail. All six of us commented that the instructors were superb, the programs were thorough and the boats in top shape. It was an outstanding experience. We can’t wait to put our new skills on the water. It was one of the most challenging and satisfying weeks! We came away feeling deeply “grounded” in our knowledge of better sailing techniques. And setting the spinnaker was a blast. We could not imagine a better instructor than Brian. He made all the abstract of the course book concrete in the class and on the water. Best instructor of any kind we’ve come across. In addition he was patient and kind – never seems to tire from our repeated mistakes. He also inspired us to continue to learn. A fantastic week! Bart had a perfect balance of not intervening too much and helping out when it was needed. He was very friendly and made time on the boat much better. I enjoyed my experience very much and had great fun. Achieved my expectations – learned a lot in a very short period of time, with a lot of on water time a real plus. Bart was an excellent instructor on boat and in classroom. His knowledge and communication skills were excellent. Brian was excellent, calm and very patient. He always answered my many questions courteously and clearly. I felt very comfortable out on the water, especially when it was rough. I learned a lot of new information and reinforced old information. I got clarity on some principles that were not clear prior to coming here and was able to ask many questions, which was helpful. I had a great time. When I started, I thought I was over my head, but as I listened and did the practical sailing I felt more and more confident. I liked that I had so many days to practice. Brian is fabulous – very calm, which keeps you calm. He explains things well so that you can see the logic of what you are doing. Then he shows you and lets you do it. I LOVED my class and the self-confidence growth in doing it. Our primary objective in taking the Performance course was to learn how to raise and lower the spinnaker. Bart and Brendan provided us with clear precise procedures for this sail and this will make us more competitive in the weekly races. Both instructors had high expectations for us and in the end helped us “raise our game” when it comes to sailing. Brian was a great instructor! He was patient knowledgeable and very pleasant. I ended up with a lot of knowledge and self-confidence! Totally impressed not just with instructors’ skill and knowledge but with their immense patience! Also, Mike explained the “why” of things so lucidly, as well as the “what” which I find so helpful in remembering. I bought a Colgate 26 from you and now I know how to sail the boat, and I’m looking forward to racing it. Your school gave me just what I needed. Everyone – Sean, Kim, and Bart – were attentive, helpful and a pleasure to work with and learn from. Terrific experience – challenging and exciting. Instruction on and off the water was excellent. We were pushed beyond our comfort zones and gained confidence throughout the week in our sailing ability. Our knowledge and understanding will help us sail our boat much better and lead to more confidence and enjoyment. The course was wonderful. It far exceeded our expectations (which were very high to begin with due to our first experience with Learn to Sail. Our instructor, Bart Lauden, was very compassionate about our sailing experience, totally understood our comfort level and pushed us far beyond. He demanded that we trust the Colgate 26 and our own sailing abilities. Our desire at the beginning of the course was to increase our knowledge of sail controls and to gain greater confidence in stronger winds. Boy, did we learn! In short we were elated with the course. We were thirsty for more sailing knowledge, came away with a comprehensive understanding of boat balance, sail shape and chute flying. Our own 22 footer will sing with our new found knowledge! Our instructor was very patient, had superior knowledge, never became excited when mistakes were made – just kept nudging us forward. The course was what I hoped for. At first I wondered about some of the more esoteric racing and sail trim knowledge, but became clear later on. Mike was fantastic – very knowledgeable, enthusiastic and made the on-water experience a lot of fun. Can’t believe how much I learned in 5 days!